Brasília is the capital of Brazil, located in the central part of the country. It is the seat of the main federal government: the president (residing in the Palácio do Planalto), the Brazilian supreme court, and the Brazilian parliament. As the world's first capital city conceived by modern standards of urban planning, Brasília is listed as a World Heritage Site by UNESCO. Building the city began in 1956 with Lúcio Costa as the principal urban planner and Oscar Niemeyer as the principal architect. When seen from above, the city's shape was designed to resemble an airplane or a bird in flight. 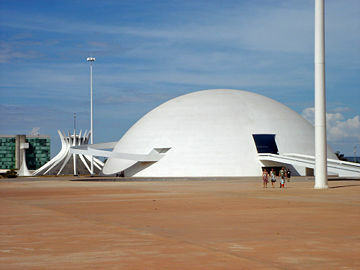 Niemeyer designed many of the city's most famous structures, including its palatial government buildings and the Cathedral of Brasília, pictured at right. In 1960, it formally became Brazil's capital. Brasília is located in the Federal District, which has the same borders as the city. The district is surrounded by the Brazilian state of Goiás. The city is not a traditional municipality by Brazilian law. It has received both praise and criticism for its attempt at creating a city by design rather than through "organic" growth, as well as for its impractical utopian conception. The city was built to bring the capital, previously Rio de Janeiro, to Brazil's midwest and closer to the other regions. This was done using a large workforce coming from throughout the country. Brasília is known internationally for having applied the principles established in the Athens Charter (1933). The charter laid out a 95-point program for planning and construction of rational cities, addressing topics such as high-rise residential blocks, strict zoning, the separation of residential areas and transportation arteries and the preservation of historic districts and buildings. The key underlying concept was the creation of independent zones for the four 'functions': living, working, recreation, and circulation. From 1763 to 1960, Rio de Janeiro was the capital of Brazil. During much of this time resources tended to be centered in Brazil's southeast region near the capital. The idea of placing Brazil’s capital in the interior dates back to the first republican constitution of 1891, which roughly defined where the federal district should be placed. The site itself was not specifically defined until 1922. The location would promote the development of Brazil's central region and better integrate the entire territory of Brazil. Then-President Juscelino Kubitschek de Oliveira ordered the construction of Brasília. Lúcio Costa was named the main urban planner after winning a contest to gain the privilege of designing the city. Oscar Niemeyer was the chief architect of most public buildings and Roberto Burle Marx was the landscape designer. 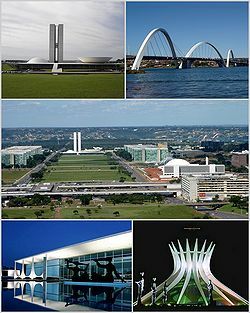 Brasília was built in 41 months, from 1956 to 1960 when it was officially inaugurated. According to a legend, Italian saint Don Bosco had a prophetic dream in 1883 in which he described a futuristic city that roughly fitted Brasília's location. Today, in Brasília, there are many references to this educator who founded the Salesian order. One of the main cathedrals in the city bears his name. The Brazilian capital is the only city in the world built in the twentieth century to be awarded by UNESCO, a United Nations agency since 1987, the status of being a World Heritage Site. Created from nothing in the center of the country Brasilia is a landmark in the history of town planning, from the layout of the residential and administrative districts to the symmetry of the buildings themselves, which are designed to harmonize with the city's overall design. The official buildings, in particular, are innovative and imaginative. Brasília is referred to worldwide as a case study in urban planning. The idea of spreading residential buildings around expansive urban areas, of tracing the city plan around large avenues, and dividing it into sectors has produced an intense debate and reflection on life in big cities in the twentieth century. Recognized for its use of grand-scale, modernist architecture and its attempt at a utopian city plan, Brasilia has received criticism for the same reasons. After a trip to Brasilia, French writer Simone de Beauvoir disappointedly said that all of its superblocks exuded “the same air of elegant monotony.” Others have remarked that the city's large open lawns, plazas, and fields appear like wastelands. To overcome these impressions, some open spaces have received various adornments and many have been improved by landscaping, thus humanizing the wide open spaces. The hasty construction of the city has also received criticism, as cracks soon appeared in buildings and highways. Finally, Brazilia's growth has now exceeded its plan, resulting in typical "urban spawl" in its suburbs. The pilot plan for Brasília was built to conform to Le Corbusier's Letter of Athens, which, according to the Modernists, embodied the ideal qualities of a city. The Letter had four basic tenets for the ideal city: Well-ventilated residences near green spaces; the separation of residences from workplaces, with industries excluded from the city proper; exclusive space for cultural activities, near residencies; and the separation of the circulation of vehicles and pedestrians. The pilot plan was based on the shape of an airplane. The heart of the city is the Monumental Axis (the fusilage of the "airplane") intersecting in the center of the city with a Residential Axis, or the wings of an airplane. The Monumental Axis, also known as the Ministries Esplanade, is an open area in downtown Brasília. Costa designed the city in four scales of design: a monumental scale, a residential scale, a gregarious (or social) scale, and a bucolic scale. The monumental scale was intended to provide Brasília with the dignity of a capital city. This was achieved with wide avenues of six lanes in each direction, the Esplanade, where the ministries and public buildings are located, the Cathedral, and the Plaza of Three Powers. The residential scale contained orderly superblocks with a uniform height of six stories, no high rises, and vast motorways providing an excellent transportation system. The superblocks also had ample parking for vehicles, low population density and plenty of wide open green space. The gregarious (or social) scale consisted of the bus station—where the two axes cross—and the entertainment, commerce, and retail sectors. The bucolic scale showed Costa's intent for Brasília to be a city of parks, where more densely populated areas were separated by vast green spaces and parks. 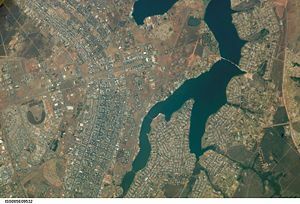 Brasília's neatly planned layout, seen from space. The Residential Axis is clearly visible, resembling the shape of the wings of an airplane. The Pilot Plan including housing for 600,000 people, primarily in "superblocks." These superblocks were large groups of apartment buildings, grouped in a very orderly manner. Each group of four superblocks was supposed to serve as a single neighborhood unit. Each group was to have a church, a secondary school, a movie house, a youth club, and adequate field space for children to play sports on. Between the superblocks were lower buildings for commercial businesses. Each superblock's six-story buildings rested on massive pillars, so there was an open area beneath the building for the free movement of pedestrians and for children to play under during inclement weather. The superblocks were also intended to be egalitarian, so that people of all income levels would live together and interact without class distinctions. 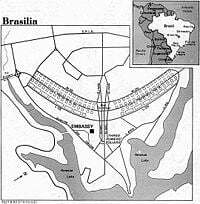 The Pilot Plan also created a vast highway network which was built to provide access to Brasília from practically everywhere in Brazil. The longest highway in this network is the 1,414-mile, Belem-Brasília highway, linking Brasília to Northeast Brazil. The construction of these highways insured, at least theoretically, that Brazil's new capital would be accessible to the entire population of the country. The city’s planned design also included specific areas for lodging, with hotel sectors, located in the north and south of the city. Other areas have opened new hotel facilities, such as in the Hotels and Tourism Sector North, located on the shores of Lake Paranoá. Being a city that receives visitors from the whole of Brazil and the world, it offers a network of restaurants with great diversity of food, from simple small restaurants, serving the authentic food of central-western areas of Brazil, to high class bistros offering diverse fare. Praça dos Três Poderes, meaning Square of the Three Powers, is a plaza in which the buildings housing the three branches of government are located. The Executive is represented by the Palácio do Planalto (presidential office; the Legislative by the Congresso Nacional (National Congress); and the Judiciary, by the Palácio da Justiça, in which is housed the Supreme Federal Tribunal, Brazil's highest court. The National Congress of Brazil. Brazil's bicameral National Congress consists of a Senate, (the upper house), and a Chamber of Deputies (the lower house). 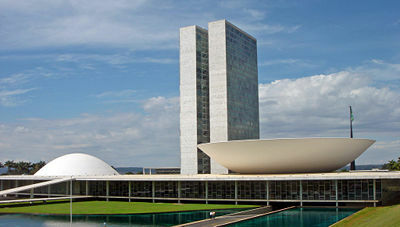 Since the 1960s, the National Congress has its seat in Brasilia. As most of the official buildings in the city, it was designed by Oscar Niemeyer following the style of modern Brazilian architecture. The semisphere to the left is the seat of the Senate, and the semisphere to the right is the seat of the Chamber of the Deputies. Between them there are two towers of offices. The Congress also occupies other surrounding buildings, some of them connected by a tunnel. The building is located in the middle of the Monumental Axis. In front of it there is a large lawn where demonstrations take place. At the rear of the building, is the Praça dos Três Poderes, where the Palácio do Planalto and the Palace of Justice lie. The Palácio da Alvorada is the official residence of the President of Brazil. Designed by Oscar Niemeyer and inaugurated in 1958, it is located at SHTN Asa Norte in Brasília. One of the first structures built in the republic's new capital city, the "Alvorada" lies on a peninsula at the margins of Lake Paranoá. The principles of simplicity and modernity oriented Niemeyer's project. The building has an area of 89,699 square feet and three floors: basement, landing, and second floor. On the basement level are located the auditorium, kitchen, laundry, medical center, and the administration. On the landing are located the rooms used by the presidency for official receptions. The second floor is the residential part of the palace, with four suites, two apartments and other private rooms. The building has also a library, a heated Olympic-sized swimming pool, a music room, two dining rooms. and various meeting rooms. Located in adjacent buildings are the chapel and the heliport. The Palácio do Planalto is the official workplace of the President of Brazil. It is located at the Praça dos Três Poderes in Brasília, Brazil. As the seat of government, the term "o Planalto" is often used as a synonym for the executive branch of the government, similar to the White House in the United States or the Kremlin in Russia. Besides the President, several major presidential advisers also have offices in the "Planalto," including the Vice-President and the Chief of Staff. The other major government ministries are laid along the Esplanada dos Ministérios. The Palace is four stories high and has an area of 43,056 square yards. Four other adjacent buildings are also part of the complex. The Supreme Federal Tribunal is the highest court of law of the Federative Republic of Brazil. The court functions as a last resort tribunal and a Constitutional Court; its rulings therefore cannot be appealed. It can also overturn laws passed by the Congress. This happens when the court judges a direct action of unconstitutionality, Ação direta de Inconstitucionalidade or Adin. The members of the court, who are called ministers (ministro), are appointed by the President and approved by the Senate. They serve until compulsory retirement, at 70 years old. The number of members has changed through history. The Constitution of 1891 decided that the court would have 15 members. When Getúlio Vargas came into power, the number of members was reduced to 11. It changed to 16 in 1965, but returned to 11 in 1969. It has not changed ever since. Brasília's economy is dominated by the services, which account for 91 percent of the local GDP. These include government, with the public sector accounting for around 40 percent of the city jobs; communications, including Brasil Telecom's headquarters, as well as public and private television stations; banking and finance; entertainment; information technology; and legal services. Industries in the city include construction, food processing, furniture making, recycling, pharmaceuticals, printing, and publishing. The main agricultural products produced in Brasília are coffee, guava, orange, lemon, papaya, soy beans and mango.Brasília's farms have over 110,000 cows and it exports wood products worldwide. The city's Gross Domestic Product is estimated at $27.628 billion. The participation in the Brazilian GDP is 1.8 percent. Brasília has the largest per capita income of any city in Brazil. The consumption of commercial energy at Brazil's capital was 924 gwh, the industrial reached 337 gwh, and the residential reached 1,241 gwh. The total energy consumption was 3,319 gwh. The railways system is not developed, with only 22.4 miles operating. However, a fast-track train connecting Brasília to Goiânia is under construction. The train will travel at an average of 115 miles per hour. Furthermore, the city has a small subway (25.5 miles) covering one "wing" of the city plan of the Distrito Federal. Railways connect the city with Rio de Janeiro and São Paulo. Automobiles and buses are the main forms of urban transportation because of the priority afforded expressways in the city's design and the large distances between inner-city neighborhoods. The total extension of Brasília's paved roads is 84 miles, with 44 percent of all its roads paved. As of 2006, there were approximately 1 million vehicles in the city, for a population of about 2.3 million. Highways link Brasília with the rest of the nation. There is regular national and international air service out of Brasília International Airport (BSB) which serves the metropolitan area. There is a television tower (735 feet high) located in the heart of the city. Despite its lauded planning, Brasília is far from immune from the problems of "urban sprawl." The 1960 census counted almost 140,000 residents in the new Federal District; by 1970 this figure had grown to more than 537,000. In 2000 the population of the Brazilian Federal District stood at more than two million, more than three times the original plan. Brasília's inhabitants include a significant foreign population as well as large numbers of Brazilian migrants. Brasília is considered to have one of the highest growth rates in Brazil, increasing its size by an average of 2.82 percent each year. The Human Development Index in the city is 0.844 (developed nation level), and the illiteracy rate is around 4.35 percent. Until 1990, the Brazilian president appointed the governor of the Federal District, who was confirmed by the Senate. In that year, under the 1988 constitution, Joaquim Domingos Roriz was chosen in the first election for district governor. Reporting to the governor are numerous secretaries responsible for public works, welfare, education, law enforcement, and other concerns. The Senate acts as the legislative branch of local government. In 1986, the voters in the district elected their first congressional representatives to the national assembly, and since that time elections have been conducted the same as in any of Brazil's states. Brasília's weather is semi-arid, with seasons being defined according to the degree of humidity of the air: one season is dry and colder, while the other one is humid and hot. The average temperature is 69° F. In October, the hottest month of the year, the highest temperatures stand at 85° F, while in July, which is the coldest month, the lowest temperatures stand at 55° F.
Brasilia hosts a varied assortment of art works from great artists like Bruno Giorgi, Alfredo Ceschiatti, Athos Bulcão, Marienne Peretti, Volpi, Di Cavalcanti, Victor Brecheret, and Burle Marx, whose works have been integrated into the city’s architecture, making it a unique landscape. A scene for political events, music performances, and movie festivals, Brasília is a cosmopolitan city, with around 90 embassies, a wide range of restaurants, and complete infrastructure ready to host any kind of event. The city is a growing business and tourism destination that is a rising segment of the local economy, including dozens of hotels spread around the national capital. The Cultural Complex of the Republic ("Complexo Cultural da República" in Portuguese) is a cultural center located along the Monumental Axis in Brasília. It consists of the National Library of Brasília and the National Museum of the Republic. The National Library of Brasília (Biblioteca Nacional de Brasília in Portuguese) occupies an area of 16,744 square yards, consisting of reading and study rooms, an auditorium and a collection of over 300,000 items. The National Museum of the Republic (Museu Nacional da República in Portuguese) consists of a 17,341 square-yard exhibit area, two 780-seat auditoriums and a laboratory. The space is mainly used to display temporary art exhibits. Paranoá Lake is a giant artificial lake built in order to increase the amount of water available to the region. It holds the second largest marina in Brazil and is home to the capital's wakeboard and windsurf practitioners. 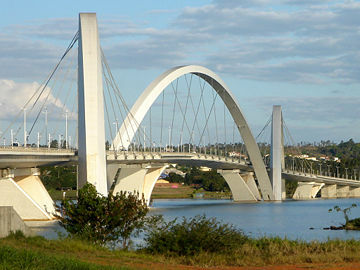 The Juscelino Kubitschek bridge, also known as the "President JK Bridge" or the "JK Bridge," crosses Lake Paranoá. It is named for Juscelino Kubitschek de Oliveira, the former president of Brazil. It was designed by architect Alexandre Chan and structural engineer Mário Vila Verde. The bridge consists of three, 200-foot-tall asymmetrical steel arches that crisscross diagonally. It is three-quarters of a mile long and was completed in 2002 at a cost of $56.8 million. It has a pedestrian walkway and is accessible to bicyclists and skaters. 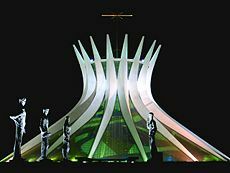 The Cathedral of Brasília is an aesthetic expression of the architect Oscar Niemeyer. On May 31, 1970, the glass-roofed cathedral was finished with only the 230-foot diameter of the circular area visible. This concrete-framed structure is a result of 16 identical assembled concrete columns, having hyperbolic sections and weighing 90 tons, representing two hands moving upwards to heaven. Traditional parties take place throughout the year. In June, there are large festivals celebrating Catholic saints, such as Saint Anthony and Saint Peter. Throughout the year there are local, national, and international events spread through the city. Christmas is widely celebrated and New Year's Eve usually hosts major events. The Brasília Cultural Foundation sponsors many national meetings in the arts and letters, and several foreign information centers are available. The National Theater features dramatic, symphonic, and operatic works. 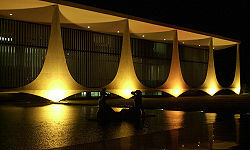 Historical institutions include the Museum of Brasília, with a historical record of Brasília's creation; the Federal Reserve Museum; and the Image and Sound Museum of the Institute of History and Geography. Brasília is home to two major soccer teams: Brasiliense Futebol Clube and Sociedade Esportiva do Gama. The main football stadiums are the Estádio Mané Garrincha and the Serejão. The University of Brasília (UnB), which opened in 1962, is central to much of the city's cultural life. 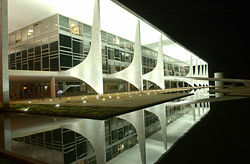 The architect Oscar Niemeyer designed its main building, the Central Institute of Science (ICC). UnB, located in the heart of Brasília on the banks of Paranoá Lake, is one of the most respected institutions in Brazil. Its modernistic buildings house 23 institutes and schools; 50 departments; 16 scientific, technological, cultural, artistic, and general service centers; student, faculty and staff residences; a hospital; a sports center equipped with swimming pools, racetrack, and various sports fields and courts; a seismological observatory capable of registering earthquakes across the planet; an animal-research laboratory and an ecological station. UnB is also about to build its own technological park. UnB’s central library has the largest archive in midwestern Brazil and caters to the needs of the Federal District and of researchers from across the nation. UnB also maintains the Fazenda Água Limpa, a farm in the outskirts of Brasília where ecological, agricultural, and forestry research is conducted. Each semester, the University of Brasília accepts nearly 2,000 incoming students from a pool of approximately 20,000 candidates for its 63 daytime or evening undergraduate programs. On the graduate level, the university offers 64 master's programs and 45 doctoral programs. Brasília e Região Convention & Visitors Bureau. www.brasiliaconvention.com.br. Government website in Portuguese. www.brasilia.df.gov.br. This page was last modified on 23 June 2016, at 15:11.